Cedar Cove is an “over 55” manufactured home community and has been owned and personally operated by the Warrington family for three generations. Cedar Cove is a sun-drenched active adult community just 1.5 miles from Crescent Beach on Siesta Key. You've discovered an affordable way to enjoy paradise! 55+ communities in Sarasota don't get any better than this. With only 73 home sites, friendly residents and attentive manage-ment, It's a great place to call home. Cedar Cove sells both pre-owned and new homes. We are happy to help you find your perfect place in the sun - are you ready to get started? 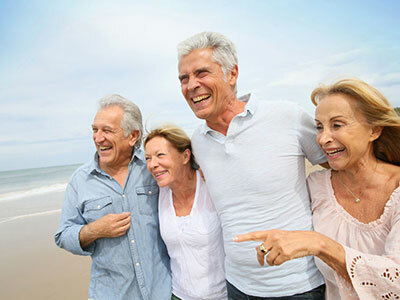 The Florida lifestyle as depicted in many of the pictures throughout our website gives you a glimpse of the various activities and lifestyle that Sarasota has to offer. Along with that Florida’s nice climate throughout the fall and winter and into the spring makes Sarasota a great place to have a seasonal home to get out of the cold. Whether it’s great beaches, entertainment, shopping, or one of the many county or state parks Sarasota offers you the great Florida lifestyle to enjoy! Maybe you'd like to grab some lunch overlooking Sarasota Bay. Or perhaps reading by the pool or playing a round of golf at one of the many golf courses in Sarasota is more your speed. Whatever you love to do, don't forget to take in a beautiful Gulf sunset once in a while. You've worked your whole life for this, so enjoy! 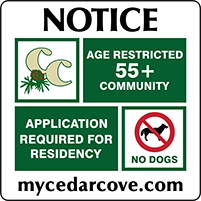 Cedar Cove is a fun and active community of residents who often get together for activities, both on and off-property. Do you love watching baseball, or trying out new restaurants? At our small, family owned community, you'll have plenty of opportunities to make new friends who share your interests. Cedar Cove Manufactured Home Community invites you to live an amazing tropical lifestyle without the high ticket price. 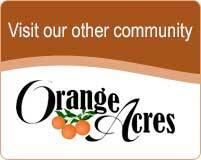 Compare us to other over 55 communities in Sarasota, FL. You'll find competitive lot rents which are among the most affordable in the Sarasota/Manatee area – and a wonderful place to live. - Paul & Vinny D.
"After being snow birders in Cedar Cove for two, years we decided to sell our home up north and purchase a home in Sarasota. We took several months and visited about two dozen parks. We were not able to find one that matched up to Cedar Cove. The people in Cedar Cove are what convinced us that we wanted to be part of this community. Cedar Cove is a place where you can enjoy life and make good friends. There are lots of activities to join into or you can just sit by the pool and relax. " - Joe & Cindy C.
"As a resident of Cedar Cove Manufactured Home Community, it is a pleasure to live in such a friendly and caring community. I would recommend Cedar Cove to anyone looking for a piece of “Paradise”. " "Our family has lived in Cedar Cove for over 45 years. The Cedar Cove community is very caring and you can be involved as much as you wish. The management works well with the residents and there are always activities to keep your interest if you choose. Friendships are many and it is a place to be happy."